Julie Courtney has been an independent curator since 1991. She was founding director of The Temple Gallery and curated exhibitions there from 1985-1988. Some of her most notable exhibitions were: Constitution by Group Material (catalogue); D.A.R.I.N.G (Diamond Acres Real[i]ty Network Group) by Phillips Simkin (catalogue); The Body Electric: work by Louise Bourgeois, Mia Westerlund-Roosen, Jody Pinto, Nancy Spero; and Small Buildings: Furniture and Proposals for the Typical House by Allan Wexler. Following this she was consulting curator at The Institute of Contemporary Art from 1989 - 1991 where she curated Hiroshi Kariya Sutra: Everything in One Thing; One Thing in Everything; Philadelphia Art Now: Artists Choose Artists, the inaugural exhibition for the then new ICA at 36th and Sansom; and David Hammons' Rousing the Rubble. 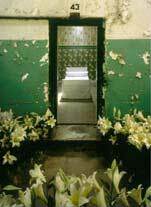 In 1995 she co-curated with Todd Gilens Prison Sentences: The Prison as Site/The Prison as Subject, her first foray into commissioning site-specific projects in unusual spaces. This 6 month project consisted of 14 commissioned projects by 20 artists and Amnesty International. Artists included Jonathan Borofsky, Beth B, Allan Wexler, Virgil Marti, Grennan & Sperandio, Bruce Pollock, Winifred Lutz, Christina Kubisch, John Phillips and Carolyn Healy, Malcolm Cochran, James Casebere, Willie Cole, Fiona Templeton, and Homer Jackson (with Mogauwane Mahoele, Lloyd Lawrence, John Abner and Richard Jordan). This project began Eastern State’s contemporary art program. She served on their art advisory board for many years. In 1996 she curated Points of Departure: Art on the Line, a project funded by the Philadelphia Exhibitions Initiative (PEI), a program of the Pew Center for Arts and Heritage, of temporary site-specific projects in 9 train stations from 30th Street Station out the "Main Line" to Bryn Mawr Station. Artists in the exhibition were Dennis Adams, Susie Brandt, Don Camp, Maria Elena Gonzalez, Virgil Marti, Tim Rollins & KOS, Kay Rosen and Richard Torchia. 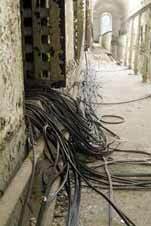 In spring 2005 two major PEI-funded projects opened: Pandemonium, a percussive sound installation by Janet Cardiff and George Bures Miller at Eastern State Penitentiary and The Lost Meeting with J. Morgan Puett and collaborators in an abandoned Quaker Meetinghouse at Abington Art Center. In 2006, Courtney commissioned meta Metasequoia, a large viewing structure by John McQueen, Margo Mensing, and J Shermeta, for Morris Arboretum, Philadelphia. That year she was also the curator for Inside/Out: Sculpture at Evergreen, an exhibition of ten site-relevant projects at John Hopkins University, Baltimore, MD. 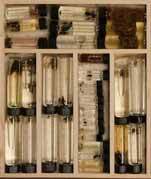 In 2008 she curated Mark Dion's Travels of William Bartram – Reconsidered at Bartram's Garden, Philadelphia. Dion retraced the travels of botanist and artist William Bartram (dates) to northern Florida and sent back specimens, water samples, wildlife and alligator kitsch. He likened the trip to “part Lewis and Clark, part Jack Kerouac, part Borat, and part Pee Wee's Big Advenure”. This project was also supported by PEI as well as the Pew Marketing Initiative, which helped to produce the website www.markdionsbartramstravels.com. In 2009 Courtney received support from PEI and the National Endowment for the Arts for Release, a collaboration between filmmaker Bill Morrison and composer Vijay Iyer at Eastern State Penitentiary. In 2010 Courtney was engaged by Community College of Philadelphia through the Redevelopment Authority’s Percent for Art Program, to commission two permanent public art projects. One project is for the Northeast Regional Campus and one for center city. These projects will be realized in 2011 and 2012.